If you’ve purchase a theme from this site, you need to have WordPress installed through a web host. This is known as a self-hosted installation. The alternative option is to create your blog on WordPress.com, where you can also purchase some of our themes. If you are looking for the highest-quality managed WordPress hosting available – look no further. 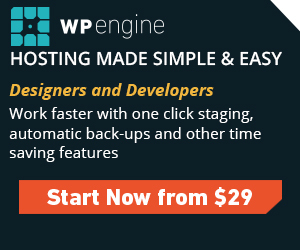 WP Engine provides managed WordPress hosting for serious designers and developers. Even basic accounts come with daily automated backups, one click restores, automatic WordPress core updates, and security scanning with Sucuri malware protection. The support team at WP Engine is fantastic and the hosting options are second to none, especially for developers. Please note that we will receive a small commission for account sign-ups through the affiliate links above. That does not not affect our recommendations as they are based on quality and past service.